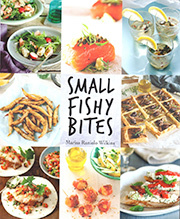 Small Fishy Bites celebrates the diversity and versatility of seafood. Small plates are a pleasant way to sample a range of meals without the commitment to one entrée or several different courses. There are 100 recipes. 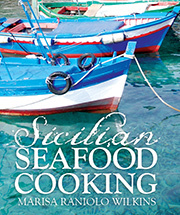 Each chapter covers a different way to serve seafood; Tidbits features bite-sized meals; Cases and Bases includes blinis, crepes and pizza; Soused and Best Dressed has wonderful recipes for marinating seafood; Floured, Crumbed and battered shows you a variety of different techniques to batter and fry your fish; Sozzled has a selection of seafood served with alcohol including oyster shooters and spreads made with whiskey; Spreads include fish spreads, potted shrimp and pâté; Hefty Shells includes scallop, oyster and mussel dishes; the Minced Fish chapter has a range of balls, patties and croquettes made from fish and shrimps. Small Fishy Bites has also been translated into Dutch and it is called Tapas Met Vis.